Notes: What is the Sherman Filterbank 2? A powerful analog filtering and distortion unit with a huge frequency range and a killing TUBE overdrive behavior. 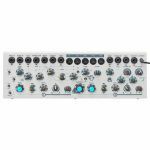 A small modular system? YES! Application: processing every sound source, effect mixing, expanding modular systems, etc. The original Sherman Filterbank (Version 1) is no longer being made and is thus now completely being replaced by this new version ! There are 5 extra NEW SWITCHES, 1 extra INPUT (for footpedal), 2 extra new LEDs, a NEW COLOR (silver-grey) with an improved (long-lasting) varnish layer. We also do have new packing-boxes (silver, with photo on upper side), new flashy stickers (silver) and new adaptors (with Sherman-logo). All this with the famous solid SHERMAN-QUALITY and the well-known thorough & speedy AFTER-SALES service (repairs). There are 5 extra switches and 2 extra LEDs, and on the back panel there's one pedal input jack. A reworked front-panel lay-out and the grey metal color. The pedal input allows foot control of freq1and bypass/effect switching. You can rewire an old wah (because they have a switch on board) as shown by te diagram in 'extra stuff'. Another 3-way switch allows "Sensitrig" (which makes the triggering twice as sensitive for, e.g. clean string pad filtering) and "Limit", which leaves the filters more "breathing room" for self-oscillation if the input stage is extremely overdriven. 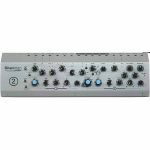 A 3-way switch has 2 general transpose functions : +1 Octave and + Quint which works nice with monophonic signals, and has a specific dirty character. A 3-way switch for the really powerful and quite revolutionary "Tracking" function - a monophonic pitch follower, that tunes filter 2 to the incoming pitch, and makes filter 1 slave of filter 2 via the harmonics switch. E.g. in position 2, filter 1 will be pitched one octave higher than filter 2, but still following the pitch. This extra switch activates the "tracking" in a normal or deep "track low" position, with stunning basses as result. 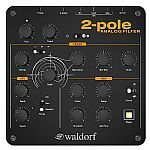 The "revolutionary" aspect of this function is that never before any similar system enhances "on the spot" harmonics and creates new harmonics with fat analog circuits. An extra white LED indicates when the tracking system is "locked on". At last there is an 3-way function switch in the LFO section, allowing sawtooth wave shape OR AR retrig : this forces an LFO restart from the AR trig with pumping grooves as unavoidable result. If you want to receive a new brochure, please ask your dealer first. All the finger-tip MIDI control you need, instantly to hand. Forget your mixer maps and do it all in real-time. An ideal solution for the gigging musician, or the musician who likes to save time & settings. The Kenton Control Freaks are made in the U.K., by Kenton, and are preprogrammed with profiles for the Sherman Filterbank as well. Hundreds of additional profiles are available for download FREE from the Kenton website. PLEASE NOTE: SUPPLIED WITH EU 2 PIN ADAPTER PLUG ONLY. Notes: A classic, but smaller - The Sherman Filterbank is a powerful analog filtering and distortion unit with a huge frequency range and a killing overdrive behaviour. It's easy and FUN to use, live and in the studio processing every sound source, effect mixing, expanding modular systems, etc. A classic, but smaller - The Sherman Filterbank is a powerful analog filtering and distortion unit with a huge frequency range and a killing overdrive behaviour. It's easy and FUN to use, live and in the studio processing every sound source, effect mixing, expanding modular systems, etc. Notes: We have to admit being more than a little proud when thinking of the Action Filter's history. Twelve years ago we made the first version of this still popular stereo-filter with no end in sight. It still is built upon the same basic principle: ACTION! Neither MIDI nor control voltage decide about filter sweeps and cues but you. Action Filter demands and supports your intuition and creativity. Reign over frequencies and rhythm instead of being a victim of technique. Like its predecessors, Action Filter 4 consists of a high-/lowpass filter-combination per stereo channel. Together, these either work as bandpass- or notch-filter with variable bandwidth and individual resonance per filter. Unspectacular but a spectacle nevertheless: Beside the mandatory RCA in- and outputs, Action Filter 4 is equipped with 1/4"-jacks. In addition, the FILTER MODE switch made it to the unit's front, labeled as STYLE. Who is the Action Filter 4 dedicated to? ... of course for all action heroes! 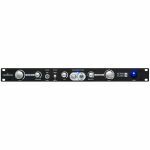 With jack- and RCA-connectors, Action Filter 4 is best suited for the DJ booth as well as for studio applications. You can use it to process full tracks or add that "certain something" to individual audio tracks. Emphasize or kill specific frequency bands and - on top of it - have lots of fun actively playing with frequencies! Simply: ACTION!